"A comforting baked spaghetti casserole with plenty of melted cheese is the perfect dish for potlucks, family gatherings, or a week-night dinner." Bring a large pot of lightly salted water to a boil. Cook spaghetti in boiling water, stirring occasionally until cooked through but firm to the bite, about 12 minutes. Drain. Heat a large skillet over medium heat; cook and stir beef and onion until meat is browned and onions are soft and translucent, about 7 minutes. Drain. Stir in spaghetti sauce and seasoned salt. Whisk eggs, Parmesan cheese, and butter in a large bowl. Mix in spaghetti to egg mixture and toss to coat. Place half the spaghetti mixture into baking dish. Top with half the cottage cheese, mozzarella, and meat sauce. Repeat layers. Cover with aluminum foil. Bake in preheated oven for 40 minutes. Remove foil and continue to bake until the cheese is melted and lightly browned, 20 to 25 minutes longer. 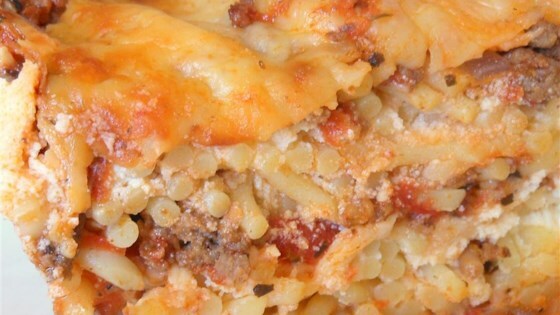 A hearty baked spaghetti casserole with three kinds of cheese. People if your not going to make the recipe as written then don't review it send in your altered recipe and let us review it. I used the ricotta cheese based on pooter61's recommendation and this turned out deliciously. Great, simple recipe. Used with whole wheat pasta. The addition of the egg mixture made the noodles extra rich. Will use again.